RiversWest has been holding an exciting series of workshops intended to teach or improve some of the skills required for boat building. The concept behind these workshops is that the member/leader is not necessarily an expert, but has organized a process and instructions, and any really specialized equipment, but all of us are figuring it out together as we go along. Since most woodworkers and boat builders tend to work alone and are often self taught, and since most of us already have the basic skills needed for these projects, this format works very well. 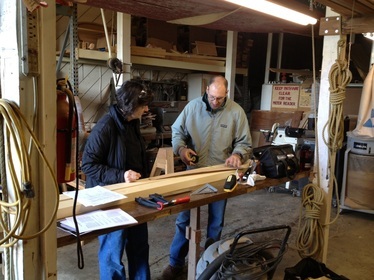 We also hold a series of demonstrations, which like workshops, cover some aspect of boat building. In these the participants will not be producing anything themselves, though they may have the opportunity for some hands-on experience in the skill being demonstrated. Demonstrations will generally take place on the first and third Saturdays between 10 and 11 AM (unless noted below), although the demonstrations could run longer. There is no fee for attending and no sign up. Just show up and enjoy.